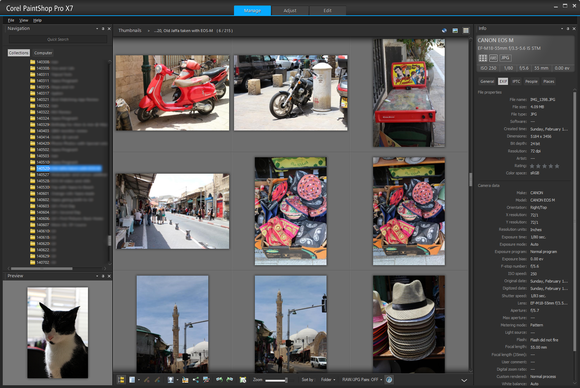 Adobe Photoshop is more than most of us need—more features, more power, more financial outlay. Corel thinks its PaintShop Pro X7 is a better fit. Retailing at $100, PaintShop Pro X7's Ultimate edition is bursting at the seams with features, and ships with a standalone portrait editor to boot. 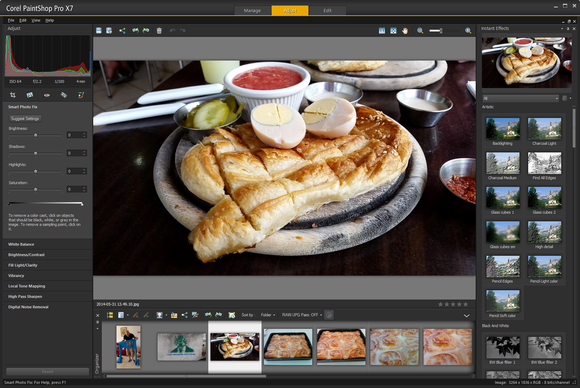 PaintShop Pro X7 wants to take care of all of your photo management and editing needs. That's quite a lot of work, so the interface breaks it down into three tabs, laid out across the top of the window: Manage, Adjust, and Edit. The Manage tab lets you go through your photo collection in style. The Manage tab is where you browse through your photo collection. You can look at image metadata, rate images, and browse through folders. You can also run a face recognition scan that then lets you browse photos by person, much like Google's free Picasa. Once you find an image you want to work with, you can click through to either the Adjust or Edit tabs. The Adjust tab lets you apply image-wide effects: You can tweak the white balance, brightness, contrast, vibrancy, and more. Along its right side, you'll find the Instant Effects sidebar. This is quite similar to how CameraBag works: A single click applies effects with names like "Retro Surreal" or "Sepia Fully aged." Just like in CameraBag, you can layer effects on top of one another. For full-photo edits and color tweaks, you may not need to go farther than the Adjust tab. If photo-wide effects aren't what you're after, you need the Edit tab. 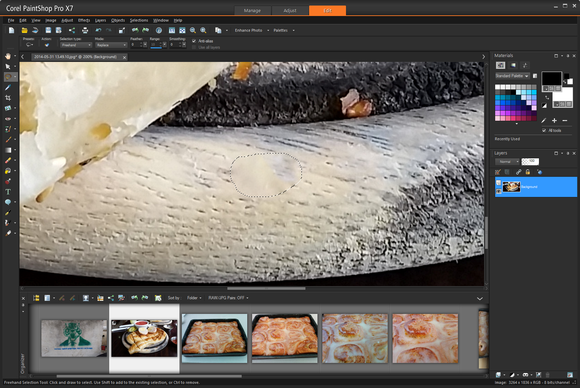 Click it, and you find yourself in a complete and powerful image editor. There's a Magic Wand, layers, a sophisticated color picker, and most important—a Learning Center that takes you through the basics. It's interactive, so you just click whatever you're interested in, and the relevant dialog opens up. The Edit tab is where serious photo manipulation takes place. Much like Photoshop, PaintShop Pro has a long and storied history—and it shows in the interface. Many of X7's key dialogs are shiny and new, making good use of the generous amounts of screen real estate most modern computers offer. But as you click your way around the interface, you'll soon come across ancient-looking dialogs, showing through like battle scars. The Effect Browser dialog feels like it came straight out of Windows 2000, folder icons and all. The Effects Browser is a blast from the past. This makes it easy to spot the new stuff, such as the beautiful and handy Smart Photo Fix dialog. With a handful of adjustments and a side-by-side view. Smart Photo Fix is easy and quick to use. 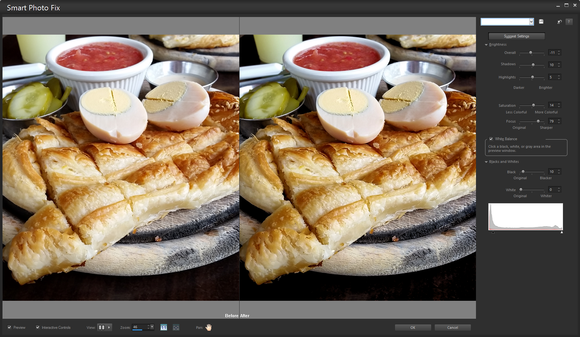 The Smart Photo Fix dialog offers some subtle ways to improve your photo, and the side-by-side view makes it easy to decide whether or not your changes actually improve anything. You can also click Suggest Settings for a starting point, but the handful of simple sliders offer satisfyingly nuanced ways to adjust your image. It works, and it did make my image look better. If you enjoy this sort of subtle photo tweaking (as opposed to applying retro effects), you're going to appreciate the Perfectly Clear plugin, too. 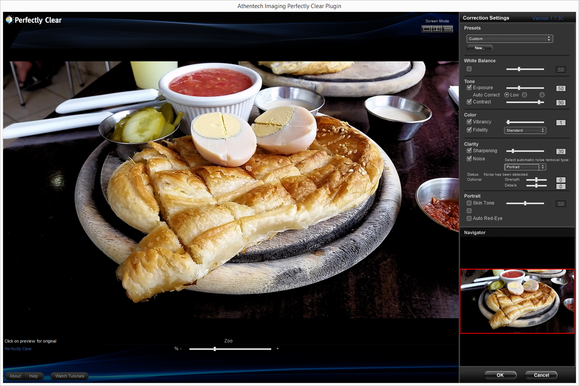 Bundled with PaintShop Pro X7 Ultimate—and missing from the $80 standard edition—it features technology made by a different company, Athentech. 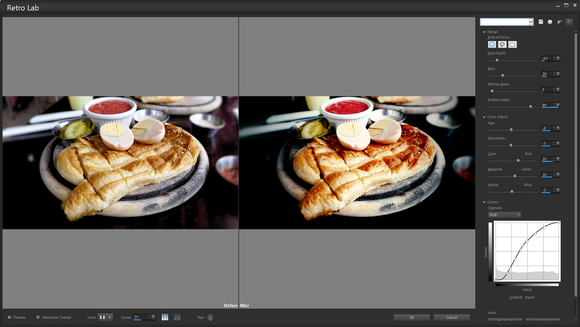 It works similarly to the Smart Photo Fix dialog, but the results you get are different due to the underlying engine. Perfectly Clear sharpens your image, adjusts the white balance and skin tones, corrects red eyes, and comes with a number of presets to boot. More powerful than Smart Photo Fix, Perfectly Clear can make your photo pop if you use it right. Having two dialogs that essentially do the same thing (a built-in one and a plugin) can get confusing, and this isn't the only point of redundancy you'll see with PaintShop Pro X7. 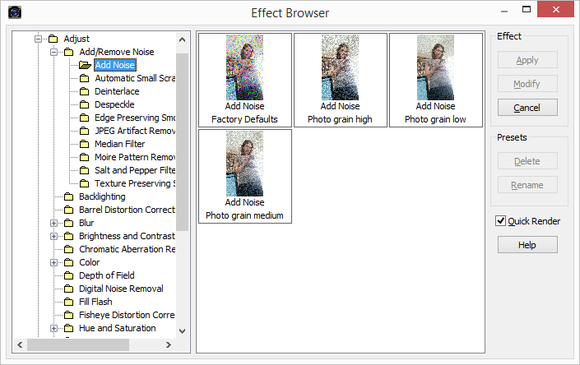 For example, the Photo Effects submenu has both a Time Machine tool and a Retro Lab tool. Both do the exact same thing: Make your photo look old. The Time Machine tool uses the old interface style (oddly appropriate, when you think about it), whereas the Retro Lab uses the new full-screen style. These two are separate from the retro Instant Effects on the Adjust tab, mentioned earlier. Retro Lab is a modern-looking way to make your photo look old. One of X7's most-touted new features is Magic Fill, Corel's version of Photoshop's Content Aware Fill. It worked well for me: I drew a rough selection around a crumb of food, clicked the button, and it was gone. Most of my attempts yielded a perfect removal, while others left a somewhat blurry splotch that was noticeable if you knew where to look for it. Changing the selection and trying again fixed this, and that stray crumb of Börek essentially vanished, leaving nothing but the wooden platter in its wake. Magic Fill works well to make crumbs of food disappear. 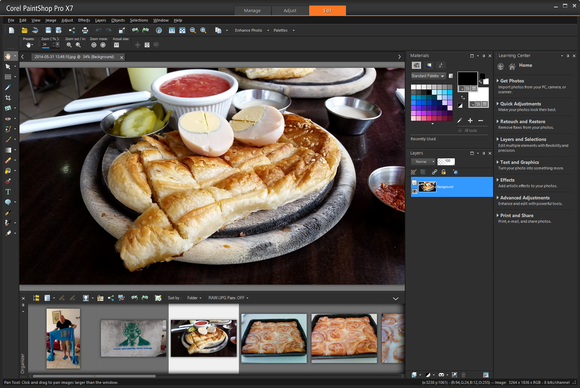 PaintShop Pro X7 gives Photoshop a real fight, especially if you're a home user or an amateur photographer. The new-style dialogs are fun to use, and the application is snappy and responsive. It did crash on me once during testing, but was stable otherwise. Having multiple ways to do things isn't necessarily bad—it means you can choose the features that work best for you. PaintShop Pro X7 Ultimate offers excellent value for money. With numerous tools and a zippy interface, PaintShop Pro X7 Ultimate gives Photoshop a real fight.